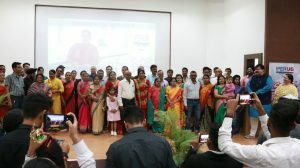 UG Student Felicitation Function Sparkles 2019 concluded at IPER campus in the presence of all students and their parents. Happy faces were prominent in the packed Auditorium at IPER Campus as the students received appreciation for their achievements in the belonging fields and got felicitated along with their parents by the Top Management of IPER Bhopal. Young gleaming undergrads basking with confidence was the best moment of the First Felicitation Ceremony for IPER UG students, and definitely a memorable one. Its a universal fact that recognition and appreciation is a confidence booster. Moreover, it makes the young minds try better and higher. IPER always motivates and guides its students to go for the higher, tougher challenges in career and life. Honorable Mr. R K Sadhwani (Secretary, Chaitanya Shikhsa Samiti), Mr. Narendra Rawtani (Treasurer, Chaitanya Shiksha Samiti) and Dr. Amarjeet Singh Khalsa (Group Director, IPER) blessed the undergraduate students of BBA, BCom Hons and BCom Specialization courses for doing exceptionally well and bringing glory for themselves, for the parents and the Institution, and distributed momentos to them. The top management also took the opportunity to interact with the parents who stood along with their kids and motivated them to “Do More and Be More”. At the onset of the ceremony, the “Journey of IPER since 1996” was showcased through a video presentation. IPER is a synonym for high-quality Management Education in Central India. It is one of the premier Institutions for MBA and undergraduate Courses such as BBA, Bcom Hons and other specializations in BCom. At IPER UG Campus, the focus is on inculcating and nurturing all-round development. While not merely restricting students to academic studies. There are student communities to nurture the add-on skills of the students. Such as the Arts Community, the Literary Community, the NSS Social Work wing and the Sports Community. These communities helps students to identify their field of interest and development of personality. All the students at IPER UG strive to “Do More and Be More” ! Finally, at the conclusion of the day long event, Dr. Mahesh Soni, Member of Strategic Group at IPER thanked all the parents for being a part of the event. Likewise, he requested their supportive presence to wherever the kids wish to excel at and congratulated students while advising to stay organized and never give up on your dreams.